Santa Cruz County is as unique and beautiful a locale as you're ever likely to encounter. I love living here and I love what I do. For over 32 years, I've taken exceptional pride in making the dream of home ownership in Santa Cruz County a reality for my clients. Whether you're shopping for your very first home, looking for a vacation getaway, selling your personal home or downsizing towards retirement, nothing gives me more satisfaction than the joy of my clients at the successful close of their transaction. I'm confident you'll benefit from my thorough experience, patience, and assertive approach. A Santa Cruz County resident for over 52 years, I've lived in downtown Santa Cruz, on Beach Hill, over on the Westside, in the "Banana Belt" and down near the Yacht Harbor. I've also called Capitola, Aptos, Ben Lomond and the Elkhorn Slough home at various times in my life. With a record like that, I'm intimately familiar with every neighborhood, beach, school district and shopping spot from Boulder Creek to North Monterey County. This experience helps guide my clients to their perfect piece of paradise. In my 32 years as a real estate professional, I've earned a number professional honors, none of which would be possible without my clients. The success stories I prefer to talk about are the people who walk into my office as strangers and walk out as satisfied clients and new friends. Perhaps you'd like to read what some of my clients think about their experiences with me. People like Jim and Brigit Whims' who wanted a beachfront home for their family to enjoy, or Charles and Pam Landram for whom I've had the pleasure of assisting to sell two properties and buying one. Learn more about my past clients, achievements, or read my resume. What you can expect when you work with me? If you're buying, expect a lot of questions from me! Why are you moving? Do you have children? What's important to you in a house and neighborhood? The more questions I ask, the better chance we have of finding you just the right home. I have partnered with Natasha Mingay, my Buyer's agent, to assist with your needs as a buyer, we'll explore the various neighborhoods and available homes together. When a house "clicks", we'll offer you our expertise in helping you evaluate its condition and how this home fits your criteria. Before making an offer, we'll take a look at comparable homes on the market. After negotiating our price and conditions, we will coordinate a professional team of reliable local lenders, escrow officers, inspectors, and various services who will see to every last detail throughout the escrow period. Even after the sale is complete, we assist our clients in any way we can. The way we see it, a successful sale is just the beginning of a long relationship. Sellers have different needs. Some need to sell their home quickly. Others have a little more time to deliberate. All sellers are looking for the best possible return on their investment. In each situation, I like to tailor my services to meet my clients' specific needs. That means evaluating a property's potential, suggesting various pricing and listing strategies, preparing the home, and the seller, for marketing. We'll ensure maximum exposure of your home through the internet, multiple listing service, broker previews, print advertising, open houses, and custom brochures. I believe that my attention to detail, my negotiating skills, my clear communication, honesty and enthusiastic nature are why so many of my clients are pleased with their transactions. But real estate requires a true team effort. And I think many of my clients learn a great deal, not just about real estate, but about themselves, through our process together. Before you go, I'd like to thank you. I know that hiring a real estate agent is a big decision. And I'm delighted that you've considered me. My website is here for you to use in any way you find useful. There are links to help you familiarize yourself with the various aspects of home buying, home selling, financing and much, much more. Please browse around and see for yourself. And, please, don't hesitate to contact me, for any reason at all. If I can answer a question, help you find a contractor, or just recommend a great lunch spot, I'm happy to be of assistance. 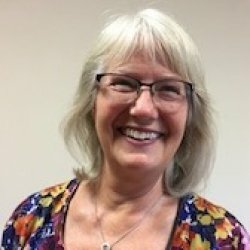 I'm a qualified senior real estate specialist (SRES®), which means I'm uniquely qualified to assist seniors with their specific home buying and selling needs. As you get older, your needs and interests change, and it can be a good time to change your living situation too. Empty nesters find themselves with too much space, while others may be looking to make the most out of their retirement by spending it in the waterfront home they've always dreamed of. Others may need to relocate for mobility reasons. Whatever your reasons are, I have the education and experience to help you find your ideal home and sell your current one for top-dollar. An in-depth understanding of common senior buying and selling issues. Will offer a no-pressure approach and will ensure you have the information you need without overwhelming you. Will go the extra mile to ensure you're 100 percent comfortable with each decision throughout the entire process. Understands the specific needs of senior buyers and sellers and will go the extra mile to ensure they're met. Is knowledgable about the different types of senior housing options, including CCRC's and active-adult communities. Are aware of the types of lending options available to seniors and can help you steer clear of scams and loan schemes. Can connect you with resources like home inspectors, movers, CPAs, lawyers, and so on, that also specialize in senior matters. We real estate agents often list our awards and achievements. It shows our success, experience and longevity in a challenging profession. Luxury Home Specialist- Qualified to List Coldwell Banker's Premier Properties. 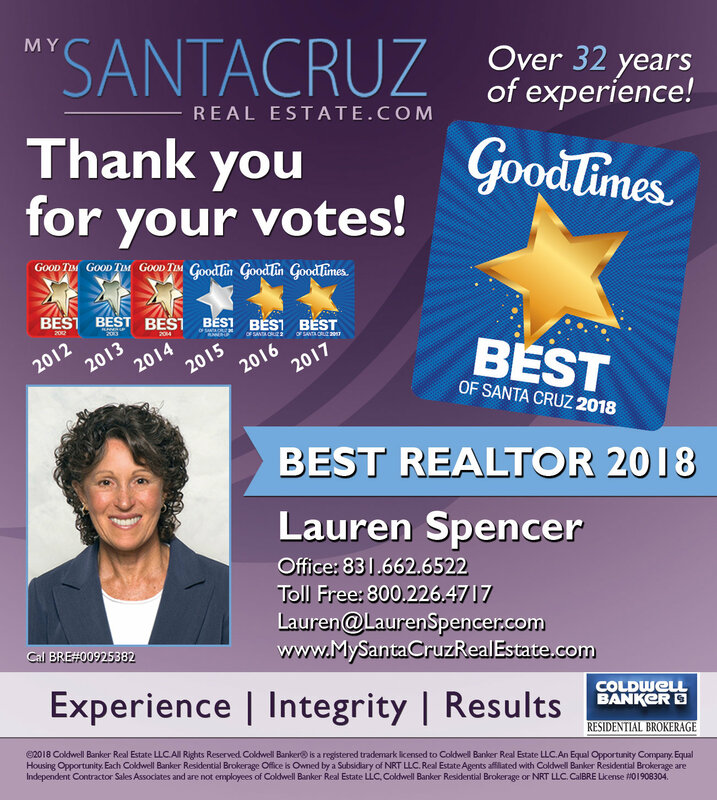 If you have any questions about buying and selling real estate in the greater Santa Cruz area, contact Lauren Spencer, Coldwell Banker Residential Brokerage at 1-831-662-6522 or Toll Free: 1-800-226-4717.